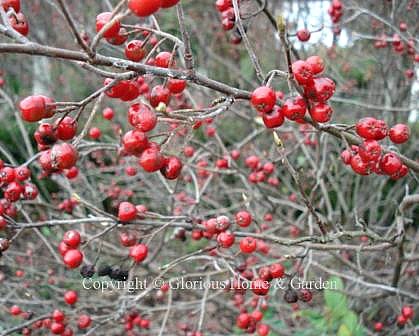 Brilliant, Persistent Winter Berries on Shrubs and Trees Provide Color and Beauty in the Garden. 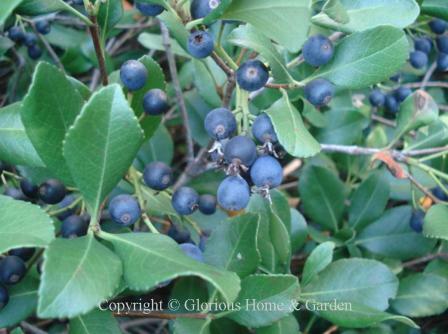 The appearance of winter berries on shrubs or trees is one of the charms of the season. Whether covering a plant or peeking through the leaves, they lend color to the garden when most everything else is gray or brown, provide food for birds, and make for readily obtainable natural Christmas decorations. 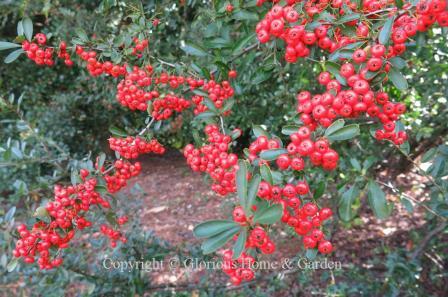 Hollies come first to mind for berries. 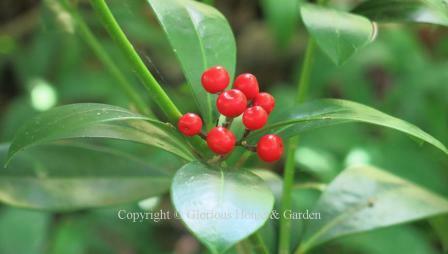 There are red, black, orange,yellow and white-fruited types, evergreen and deciduous ones. I am presently nandina-less, but I would love to be able to go out to the garden and pick the large clusters of red berries for wreaths and garlands—guess I better plant some! Depending on where you live, there are shrubs and trees that will suit your climate and reward you with winter color and beauty. Here is a list of some of the possibilities. I have listed mostly the species. Check with your local nurseries for specific cultivars that are best for your area. Ardisia japonica, Japanese ardisia or marlberry, Zones 8-9—evergreen ground cover for shady situations, produces persistent red winter berries. 'Chirimen' is shown below. 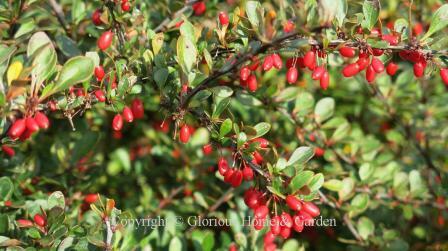 Berberis thunbergii, Japanese barberry, Zones 4-8. Barberries are often used for hedges and barriers due to their thorns, but the red berries produced in the fall are decorative and are good food source for birds in the winter. 'Kobold' is shown below. 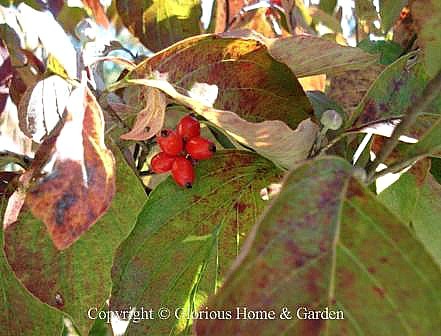 Cornus florida, flowering dogwood, Zones 6-9—tree, bright, ornamental red berries persist into winter, but are usually eaten by birds and gone by spring. Also, the fat flower buds that appear in late fall are ornamental throughout winter reminding one of the show to come. 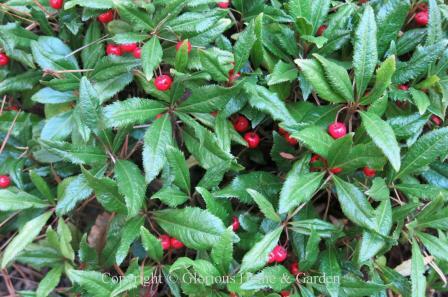 Ilex cornuta, Chinese holly, Zone 7-9—evergreen shrub or small tree, large round red berries persist through winter. Common cultivars like Burford, Carissa and Needlepoint are in this group. There are some yellow-fruited varieties. I. cornula d'Or is shown. Ilex opaca, American holly, Zones 5-9—evergreen tree, persistent red winter berries contrast with spiny green leaves. 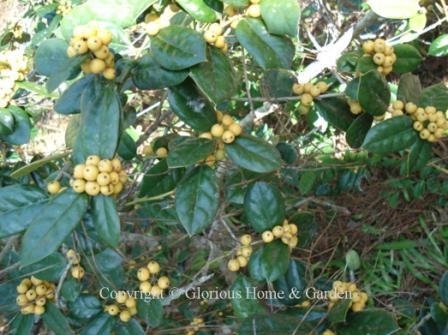 Ilex verticillata, winterberry holly, Zones 3-9—shrub or small tree. 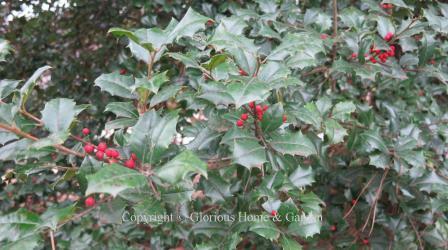 This deciduous holly is usually very heavily loaded with red winter berries. 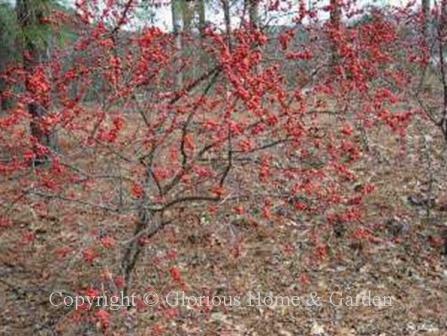 Can be spectacular in late fall to mid-winter landscape before the birds strip the plants. Must use a male pollinator. 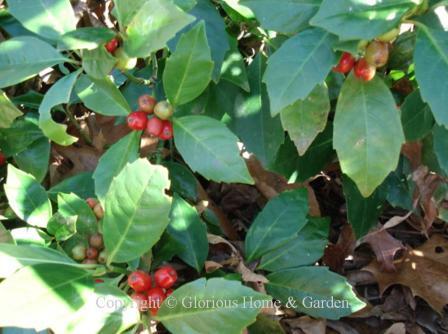 Ilex vomitoria, yaupon holly, Zones 7-10—evergreen shrub or small tree, small red fruits are abundantl. Weeping varieties are particularly nice as specimens. Native to the Southeast U.S.
Malus ‘Autumn Glory,’ ‘Donald Wyman,’ ‘Harvest Gold’ ‘Ralph Shay,’ ‘Sugar Tyme,’ crabapple, Zones 4-7—tree. There are many types of crabapples. These are a few reputed to have abundant fruits lingering through winter and good disease resistance. Myrica cerifera, wax myrtle, Zones 7-11—shrub or small tree, the bayberry of the South, small grayish waxy fruits persist until birds eat them. I have seen a flock of cedar waxwings strip a shrub no time! Myrica pensylvanica, bayberry, Zones 3-6—shrub, the small grayish waxy fruits persist through winter until the birds eat them. Used for candlemaking. 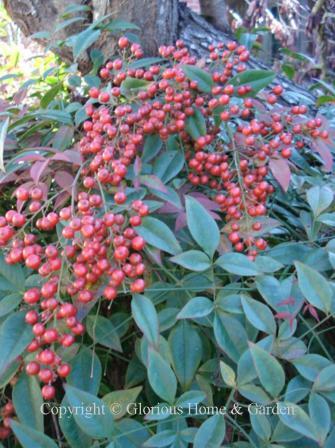 Nandina domestica, nandina, Zones 6-9—shrub, produces large, showy, heavy panicles of berries that persist through winter. Great to have for Christmas decorations. 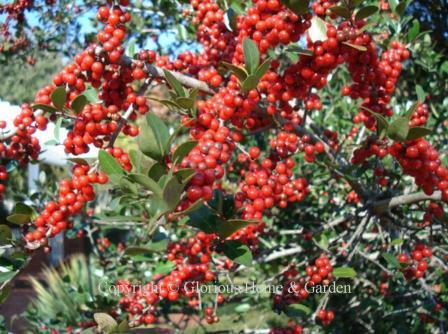 Pyracantha coccinea, scarlet firethorn, Zones 6-9—shrub, produces abundant bright scarlet red fruits. Makes a good espalier subject on a wall—beware of thorns. Pyracantha koidzumii, Formosa firethorn, Zones 7-10. 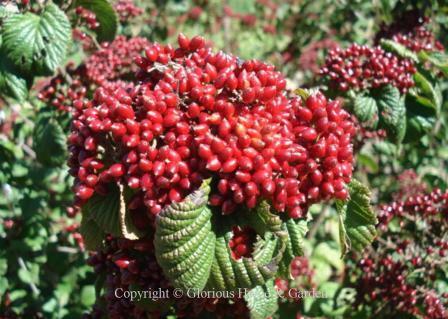 Spectacularly heavy production of red berries on a large shrub or small tree that can reach 20'. 'Victory,' shown below, is more likely to reach the 10-12' range. Great for fall and winter color. Thorny! Skimmia japonica, Japanese skimmia, Zones 6-8—shrub, bright red persistent fruits follow the flowers at the tips of branches—very showy. 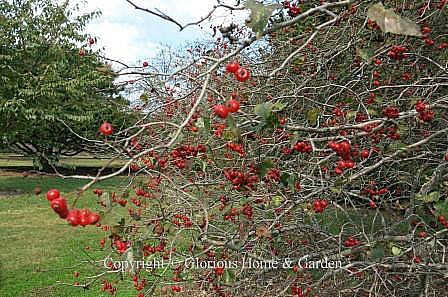 Viburnum dilatatum, linden viburnum, Zones 5-7—shrub, excellent red fruit color. 'Asian Beauty' hand 'Cardinal Candy' are two good cultivars that hold there color well through the winter.